In recent years the European Union (EU) has played an increasingly important role as a manager of global conflicts. This book provides a comprehensive assessment of how the EU has performed in facilitating mediation, conflict resolution and peacebuilding across the globe. 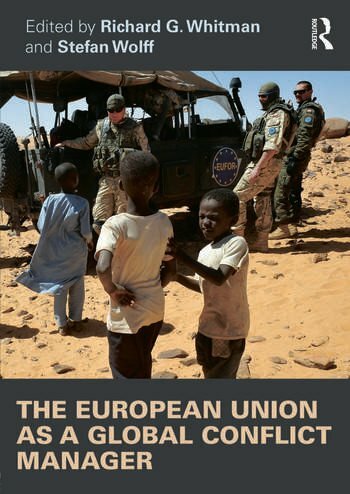 Offering an accessible introduction to the theories, processes and practice of the EU’s role in managing conflict, the book features a broad range of case studies including Afghanistan, Bosnia & Herzegovina, Cyprus, Israel-Palestine, Macedonia and Moldova and examines both the institutional and policy aspects including the common foreign, security and defence policy. Drawing together a wide range of contributors, this will be of great interest to students of European Foreign Policy, the EU as a global actor and conflict resolution and management. Stefan Wolff is Professor of International Security at the University of Birmingham, UK, and a Member of the Governing Council of the European Centre for Minority Issues. Richard G. Whitman is Professor of Politics and International Relations in the School of Politics and International Relations at the University of Kent, UK.